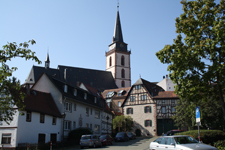 A tour of the old town (Altstadt) part of Oberursel is being offered on Saturday, 6th June, 2015 at 2pm. 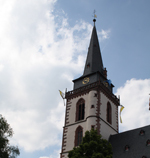 The tower of St.Ursula’s Church in Oberursel will be open to the public on Saturday, 6th June, 2015 between 3pm and 5pm. 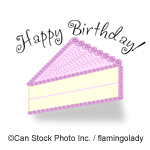 Congratulations to Frau Elvira Heep in Oberursel who is 90 years old today. As the organisation is not a commercial cinema, they are not allowed to advertise which film will be shown in advance. For Tuesday, 2nd June, 2015, we are told that it will be a “bestseller adaptation”. If you do want to know which film will be shown then call 06171 636930 and they will tell you. 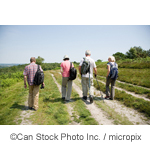 The Seniorentreff in Oberursel will be offering a 3,000 step walk on Wednesday, 3rd June 2015. This weekend sees one of the largest festivals in Oberursel take place – the fountain festival or Brunnenfest. The event kicks off on Friday evening at 5.45pm with an open-air church service at the Marktplatz followed by the official opening with Fountain Queen Christina II. Other highlights include the re-inauguration of the Wete Fountain on Saturday morning in Stierstadt at 11am and the 5, 10 and 21.1km festival runs at 10am on Sunday morning at 10am. For children up to the age of 10 the Kindermeile will be in the Obere Hainstraße on Saturday between 3pm and 6pm and the annual duck race on the Urselbach will be held on Sunday at 3pm with tickets being sold on Saturday in the Obere Hainstraße. Congratulations to Herr Rudi Hörner in Oberursel who is 90 years old today. 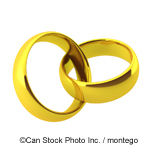 Congratulations to Norbert und Anita Wehner in Stierstadt who are celebrating their Golden Wedding Anniversary today! EU nationals and the Mayoral Election – which issues are important to you? Residents in Oberursel cannot have failed to notice the large posters around the town with photos of the two Mayoral candidates on them. The election takes place on Sunday, 21st June, 2015 and under certain circumstances, EU nationals will also be able to cast their vote. “Jazz meets Mühle” is being held for the fourth time this year, and is again being held on Whitmonday, 25th May 2015, and involves as always the mills along the Mühlenwanderweg. At four places along the route there will be jazz bands playing, with refreshments available and a chance to see the historical buildings from a new perspective.